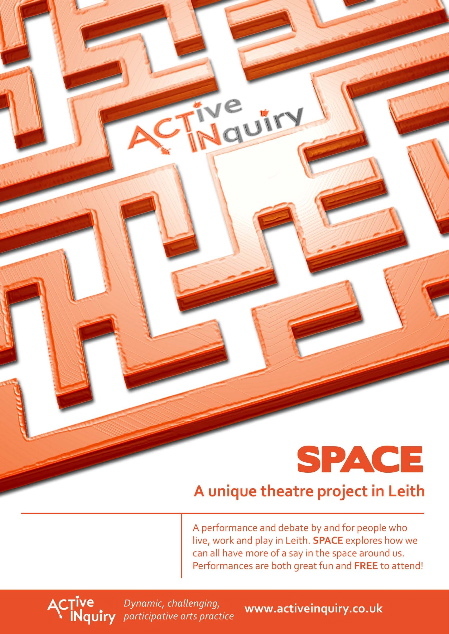 The pioneering Leith community theatre group, Active Inquiry is making its debut with SPACE, the story of Maggie, an ordinary woman who finds it difficult to persuade people in the local community to help her save the neighbourhood park from being turned into a car park. (Next performance Wednesday 13th May). Active Inquiry is drawing on the ideas of Boal (perhaps best remembered for creating the Theatre of the Oppressed ) as they develop a unique theatre project in Leith with the help of local actors and people who have never worked on a stage before. You can see the results for yourself in Leith this month and during Leith Festival in June. As Gavin Crichton, artistic director, points out, performances are all free of charge. SPACE – exploring people’s relationship to the space around them – is at Out of the Blue, Dalmeny Street, on Wednesday 6 May, 7pm. And at Duncan Place Resource Centre, Duncan Place, EH6 8HW the following week, Wednesday 13 May, 7pm. There is more about the life and thoughts of Augusto Boal in an online interview. This is no ordinary play. I saw the performance in Out of the Blue on Wednesday and soon discovered there was no real boundary between actors and audience. Don’t miss the third performance. It’s in Duncan Place Resource Centre next Wednesday, 13th May.